Back in the early days of gaming the term “bedroom coder” was common. In fact most games of that era came from bedroom coding. As the industry flourished so did the coders. Many started up development studios or tech companies and many of these are still around today. The likes of Codemasters and Activision for instance all began in a bedroom. As times have rolled on the technology has become more complicated and therefore much harder for a single person to code a whole game alone; it still happens but most of these games are a result for mobile or one of the frankly, pretty terrible games for the PC. The developer of Ghost 1.0 wants to buck that trend and has worked hard to achieve that with this game. From the off it’s a good effort and the game avoids almost all the pitfalls that are really prevalent with developing on your own. 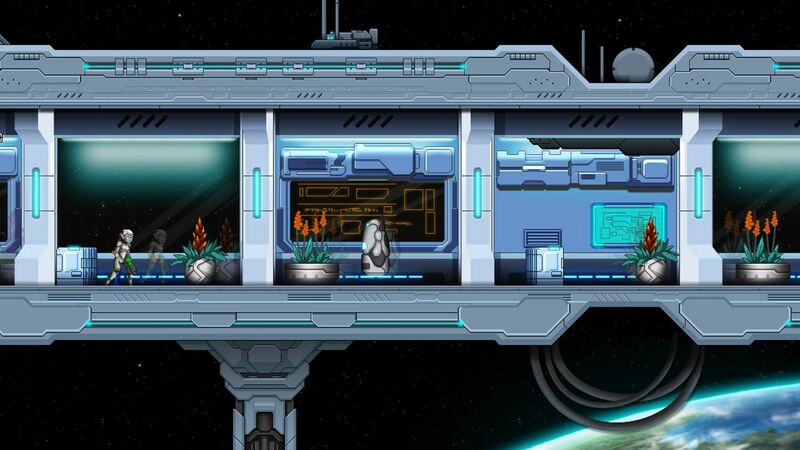 Ghost 1.0 begins with your character wedged in a container in the back of a truck in a bid to infiltrate the Nakamura space station; your mission is to retrieve the schematics of the Nakamura corps’ latest high tech robot. It becomes apparent pretty early on that those who hired you are a pair of amateurs and you end up winging a lot of the mission by yourself. When you do talk to these guys it’s usually played out in a short cutscene that I found to be placed a little strangely – they can happen in the oddest of places and have a habit of breaking up the flow of gameplay. The scenes themselves are well voiced and do try to inject a bit of comedy into the mix, with some great references to our everyday lives. I’ll admit I did actually have a little chuckle on the odd occasion. Ghost 1.0 itself is definitely of the metroidvania variety and fans of these types of games will feel very much at home here. The controls are pretty much a staple of the genre here too with jumps, rolls and targeting all handled in intuitive ways. You learn early on that your character is actually just inhabiting a robotic suit rather than physically being there and this opens up an interesting mechanic that sets itself apart from others in the genre. At the push of a button you can “ghost” out of the robotic suit and float around the environment; using this method you can take control of any other robots in the area, and this leads to some interesting puzzles where you need to control multiple other robots in order to open pathways or switch on the power in an area. It works beautifully and when used in more obtuse ways can lead to some genuinely amazing gameplay moments. Taking control of an enemy surrounded by other robots for instance can lead you to clear out a room without even going close; watching the enemies panic and fire on each other can be hugely satisfying and you find yourself relying on the mechanic more and more as the game goes on. 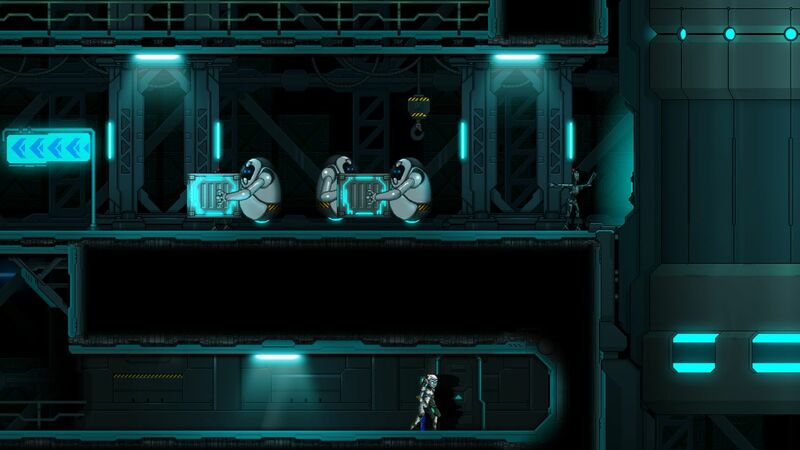 RPG and roguelike elements are also injected into the mix. When you die you drop any items or weapons that you hadn’t yet saved, but if you can make it back to the body these items can be collected again. It’s an interesting use of the mechanic and again adds that little extra to the game. Moments of genuine tension and terror ensue when you’re low on health, carrying some good stuff and desperately searching for the nearest save point. You can also collect various skills points around the map allowing you to upgrade abilities or add new ones like a double jump for instance. Yet again it all works really well, the skills are well paced and give you access to previously unassailable areas of the map, while others aid you in combat when you need it the most. Ghost 1.0 does sometimes suffer from some really horrible difficulty spikes though – rooms can trigger alarms that see you blasted away in seconds and some of the boss fights can border on unfair. This can lead to some pretty hefty rage quitting, but should you stick with it, the spike eventually drops back down. There are also a variety of weapons and upgrades that can be purchased in shops dotted about the map. Each of these offers something a little different so you do occasionally find yourself having to backtrack quite a bit to grab that item that you couldn’t quite afford previously. This does unfortunately break the flow again and would possibly benefit by allowing all ships to stock every item rather than just a selection. Graphically Ghost 1.0 does a great job of bringing things to life. 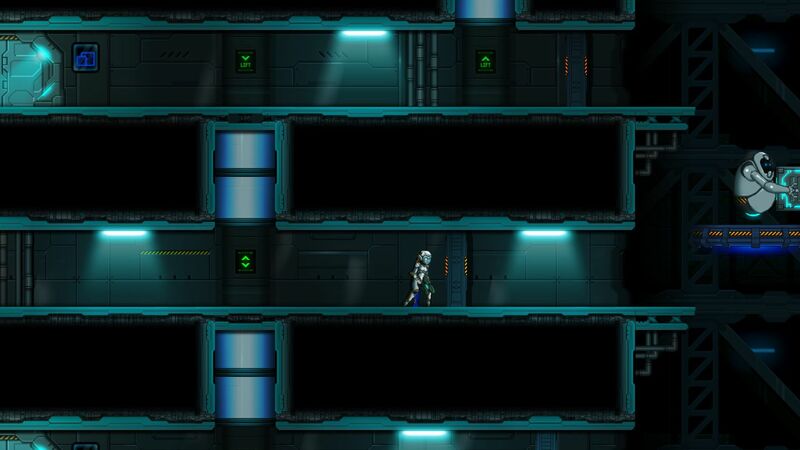 The space station is packed with well animated enemies and NPCs, and the environments are beautifully varied too. As you move through the station you come across lush natural areas as well as more typically industrial zones. The game is paced well enough that an environment will change before you start to become bored of it and there’s a really nice variety of enemies, and bosses that look great and are well animated. My only issue here is that the cutscenes seem to be much more static than the gameplay and often look more like a pane of a comic book than an animated scene. Overall I must say I’ve been really surprised by Ghost 1.0. Going in I was sceptical that a single developer could bring a vision this vast to life, but that’s exactly what has happened and bar a few small issues here and there Ghost 1.0 is a genuinely stunning game – it is certainly one that any fan of metroidvania will absolutely enjoy.